I was ready. 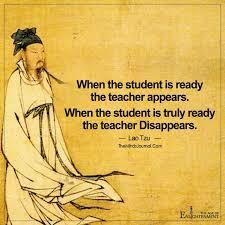 Two teachers appeared today in my life. The thrill of learning something new is an amazing feeling. I keep getting this feeling often, particularly when learning new things from younger people. Two young teachers appeared for me today. First one was RH, an old colleague from the late nineties of the last century. I had written about him in my post The Right Question. He sent me a WhatsApp message on our current political situation. I thought that it deserved a wider circulation and so tried to copy paste it and tweet it. I have had a Twitter account now for quite a while though I am not very active in it. I have recently been inspired to use it by some other friends who use it more. I am still finding my way around the application and so found it puzzling when my copy pasted message would not be accepted by Twitter. The tweet button remained inactive no matter how many times I tried. Enter my second teacher KS. I have mentioned him too many times in my blog posts to give a single link. Suffice it to say that, he is one of the few young people from whom I learn a great deal on many matters. He is a fellow alumnus from the same Business School that I am from and that is our connection. He is also a regular tweeter. I sought his advice on why my copy paste was getting rejected and sent him a screen shot of the inactive tweet button. He promptly responded saying that there was a -151 message in the frame which meant that I had 151 characters more than the Twitter application allowed per tweet. I had seen the alert but did not understand the significance till KS explained it to me and advised me to either cut the message short or tweet it in two or three instalments. I do sincerely hope that I don’t get truly ready any time too soon and that these two teachers do not disappear from my life. This entry was posted in Blogging, WhatsApp and tagged Twitter. Bookmark the permalink. 6 Responses to A Student Even Now. I admire you. you have both feet in the 21st Century! GO RUMMY! alas. I do not. nor am not even sure I want to. but I’m proud of those of you who do! Thank you Tammy. I am having a ball and hopefully continue to do so for quite some time. It helps that I have young people to hold my hands on the way! Love your post, on what we need to understand about these parts of our Net lives that often make no sense. Only having this tiny rectangular gadget about the size of my palm, for over three weeks…has been interesting. Thank you Catherine. I am blessed to have so many net/gadget savvy young people to consult when I run into trouble. It is fun to observe them having a laugh at my ineptness!